Studio accommodates a single or couple. It is 6 or 7 steps down to the sand. Zen Beach Retreat is a two-story, pristine home on a secluded, wide, sandy beach. . Breathtaking ocean views and stunning sunsets from the deck overlooking the beach. The studio has a private entrance, bathroom, queen size bed, kitchenette area with barbecue outside. Guests can park off the street. The house has WiFi. The studio adjoins the house. Lovely tropical garden setting with lush green lawns surrounding the house. 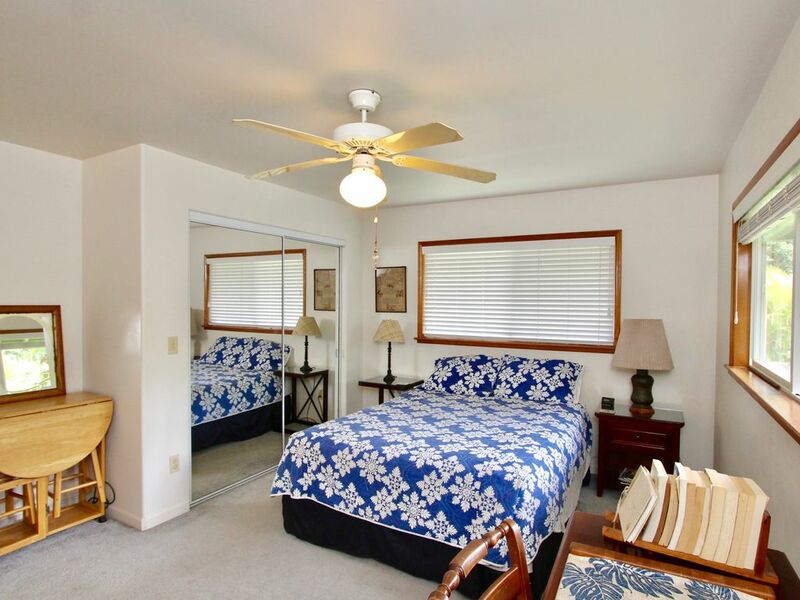 It's a few minutes drive to the village of Haleiwa, Polynesian Cultural Center, and Turtle Bay Resort. Our house is located within minutes of three world-class surf breaks (Sunset, Pipeline, and Rocky Point). It's a short walk to our food market where there is also a coffee shop. The studio with queen-sized bed rents for $110 per night. When I travel, I rent the whole house, which has two bedrooms, full kitchen, front room, dining room and lanai with table and chairs. The house accommodates 4 people and rents for $300 a night plus a cleaning fee. Whether watching the humpback whales breaching, the Hawaiian spinner dolphins spinning, or napping/reading in the hammock or lounge chairs, this Hawaiian vacation will be unforgettable. I live here on the North Shore of Oahu and the beauty is so incomparable I enjoy sharing it with guests. When I built this house in 1999 I planned it to be able to share with others. I frequently travel to Africa where I teach in a school for Maasai girls. When I am away, my home is available for rent. When I am at home the studio which adjoins the house is available. The photo is from a climb up Mt Fuji in 2008. This is not a commercial vacation rental. It is my home which is available when I am traveling. It has all the comforts of home...because it is a home. I love living here at the beach, watching the sun sink into the ocean every night, watching the surf curl and flow onto the beach. In the winter we watch for whales blowing and breaching. Being able to walk out morning or evenings without a jacket or sweater is a delight. The bike path in front of the house invites good walking or biking and good health. Strolling the beach, looking for shell, snooze in the hammock, provide respites for a hurried life. It's a short drive to Turtle Bay Resort which offers golf, horseback riding, beach dining and fine dining. In the winter the world class surfing competitions are held here on the North Shore and a walk from the house. My house is right on the sandy beach. Turtle Bay Resort is close by. Horseback riding, golf, swimming, and fine restaurants are at the resort. Village of Haleiwa is about a 10 minute drive from the house. Many restaurants and shops there. The house is on Ke Iki Beach. There are only 3 palm trees between the house and the beach. Many guests carry their meals out to the deck that overlooks the beach. There are chairs and a small table on the deck. No Garage access, No Pets, Beach Chairs, beach mats, boogie boards and snorkel gear are available. Short walk to the market and interesting food trucks. Relaxing stay right in the heart of the North Shore! Loved our stay, so relaxing and close to shops and food trucks. Kay was the perfect host. We loved sitting on the private deck watching the surf roll in. Would recommend for a laid back affordable stay. Perfect spot to stay if you are looking to be close to the beach. Also a great place if you are looking to do other activities around the island. Staying here was like visiting family. The room was not newly updated and linens/towels were not hotel-like; more like your family would provide for your visits. The room was clean, well kept and bigger than a hotel room. There was plenty of hot water and good WiFi. Kay was a great host who provided all we needed for the beach and gave good recommendations when asked. The beach view from the back deck is just spectacular. We watched whales (I wish I brought my binoculars! ), enjoyed great sunsets and big surf from there. The beach access is right there and it is the best beach around. Note that the deck is not connected to the room but is just a short walk from your private entrance on the side of the house. The unit is accurately described including not having any air conditioning which was not an issue for us in February. She provided a good oscillating tower fan that we never had to use. We would rent from Kay again the next time we go to the North Shore with only two people. Wonderful spot to watch the waves, sunsets and the whales! The backyard setting is picture perfect right on the beach and Kay, the owner, is delightful. The studio room is very basic and extremely noisy from street and foot traffic, but it’s also very centrally located. Great place to watch the waves, the sunset and the whales! This was an outstanding holiday. The views on this stretch of beach are the best on the island. Kay, the owner, is an absolutely delightful person and so easy to work with. She was helpful and informative while she also ensured our privacy. The room is cozy and comfortable with its own kitchenette and bathroom. The linens must have recently been upgraded as we found them to be soft and fresh. Morning coffee on the deck is heaven on earth. We have already booked for early summer and are eagerly looking forward to our return. Polynesian Cultural Center, the most frequently visited tourist attraction on the island, is a 20 minute drive from the house. Waimea Valley, a must-see garden and park is a 5 minute drive away. There is a waterfall in the park where you can swim, but the garden is most excellent .